Happy Monday to you! 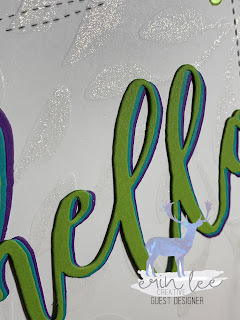 I'm excited to be a guest designer on Erin Lee Creative's Team Blog Hop! You should be arriving from Ericka's Blog. Erin has so many awesome products for sale and we are going to be showcasing them for you today. Everything is available at ERINLEECREATIVE.COM. For my card I had this idea in my head and I'm so excited that it actually turned out! 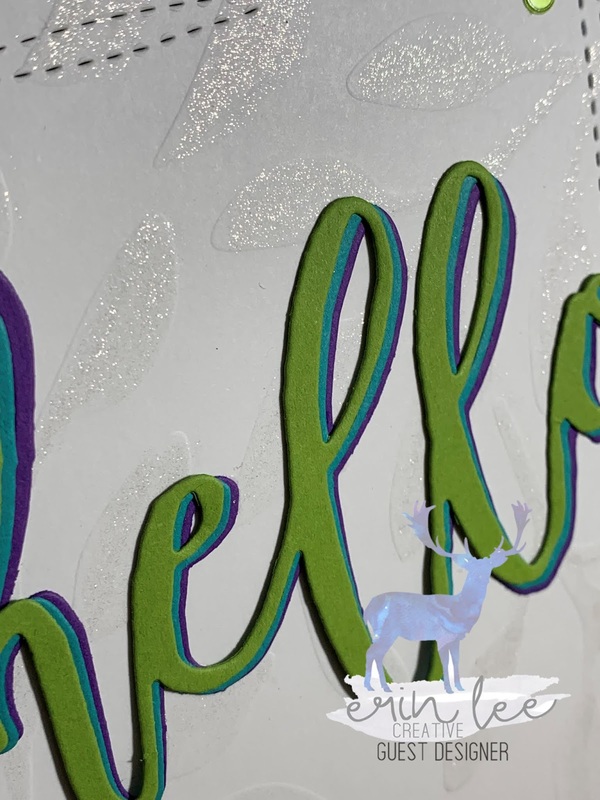 I took Erin's 6x6 Winter Leaves Stencil and ran it through my Big Shot using embossing pads. I then took a little Wink of Stella and went over the now raised stencil area. Here's a little picture so you can hopefully see the kind of shine that is all over the card. Pretty cool, huh? I love green, blue and purple and would use it all the time if I could. I hope you've enjoyed the blog hop. Just in case you didn't get to visit everyone, I've included the entire Blog Hop Order below. We are giving away three $25 gift certificates to three lucky winners chosen from comments left across all of the blogs participating in this hop. Please leave a comment on any participating blog by Friday, March 29, 2019. Three winners will be announced the following week on the Erin Lee Creative Blog. The more you comment, the more chances to win!! 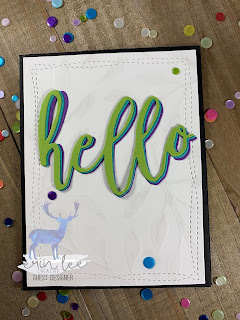 Blog Hop Order: Erin - www.erinleecreative.com/blog Cheryl - https://insteadoflaundry.blogspot.com/ Jenny - www.jccards.com Karen - littleblessingsbyka.wordpress.com Lynnea - https://www.lynneahollendonner.com Lindsay - https://lindsaydickasondesigns.blogspot.com/ Ericka - https://strangelycreative.com/ Me - http://michellescreativejourney.blogspot.com/ Thanks for stopping by!! I'm finding it difficult to keep up with all the social media sites there are at the moment. My family always comes first and with all the activities Abby is in, I find that I only have a few minutes here and there to connect. Therefore, for the time being I will be posting regularly on my Facebook page. I can do quick posts and still enjoy life with the family. I love(d) blogging but honestly here lately it has become a to-do chore rather than a fun activity. I don't like that so I'm taking a little break and we will see how things go. I'm not closing my blog cause I hope that I will get back to the love I once had for it - where I posted fun projects and updates on my family! If you want to continue to stay up to date with my projects and events please join my Facebook page at www.facebook.com/pages/Made4ubymichelle/557799584253510. Hope to see you there! Have a wonderful day/week/month/summer - and remember to enjoy all the time you can with loved ones! Thanks for stopping by! Weekly Deals & Some News! Here are this week's special deals just for you! Get them while you can!! The Retired List is coming - Check your inventory, look through your catalogs and get ready! 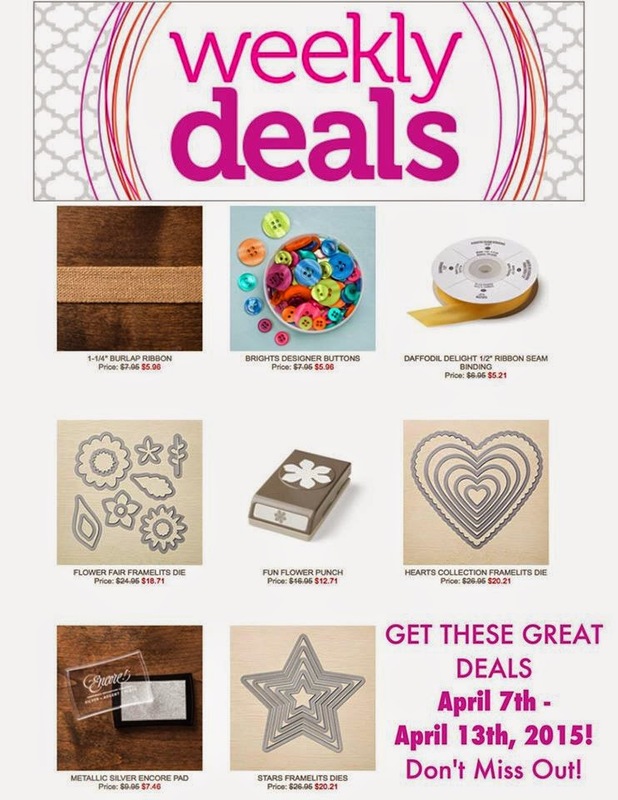 On April 21st Stampin' Up! will be releasing the Retired List (some up to 50% off). Be sure to check back! Triple Stamping Technique For Mother's Day! At Stamp Club last month we used the Choose Happiness Stamp Set from the Occasions Catalog. It's such a wonderful set cause it has a few images (see flower) as well as a TON of sentiments! You can easily find what you are needing/wanting to say! 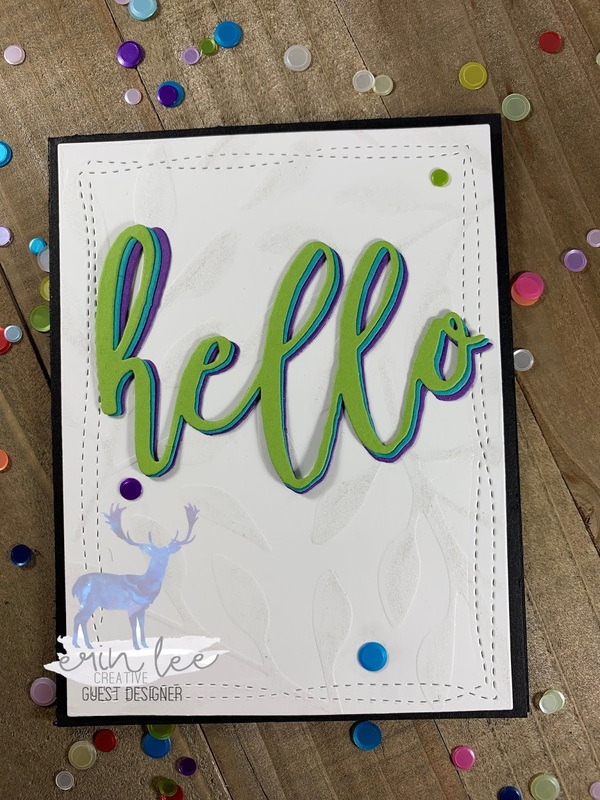 For this card we used the Triple Stamping Technique over on Splitcoaststampers. It's such a fun a pretty technique to do! We used the new In colors for the card - makes it easy to coordinate everything! Little pearls are added to each of the flower centers. On the inside we put another flower as well as our sentiment. Since Mother's Day is coming up that is what most of us picked. Are You A List Maker? You'll Love These Journals! The point to all that is these journals would be perfect for that challenge or for any type of list you need to make. It's the Grid Kraft Journals covered with DSP to look like little purses. The front has a pocket on it and it's held closed with a button/velcro closure. So cute and fun to carry around. Plus it fits nicely in my purse/bag so I can take it everywhere! FREE SHIPPING - one week only!! 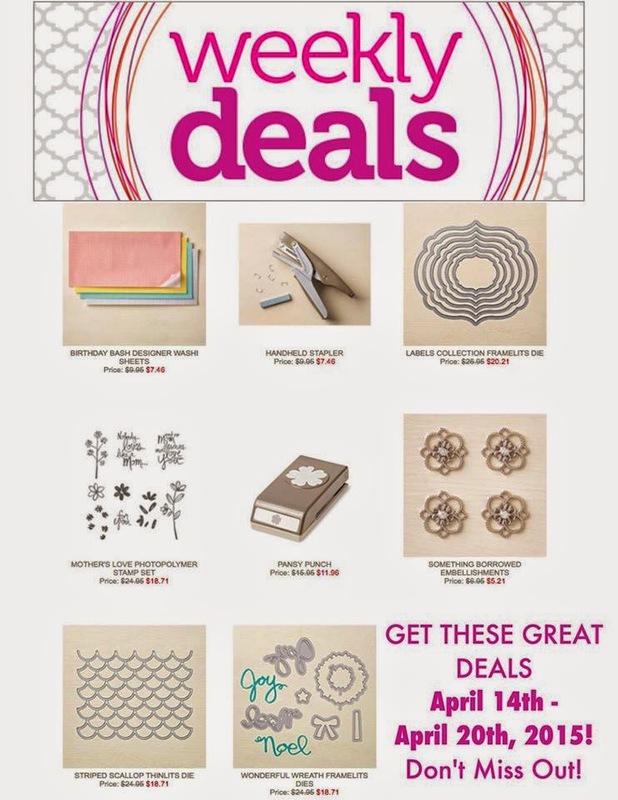 Plus New Set of Weekly Deals! It's an exciting week at Stampin' Up! For this week you can get FREE Shipping!! No minimums either - so take advantage of this great offer and get something you've been wanting. Or maybe you feel like buying some gifts for others! It's nice to surprise people! We also have a new set of Weekly Deals for you! These items are available at a special price while supplies last. Don't miss out on these two great offers! You can shop 24/7 at my site, HERE.